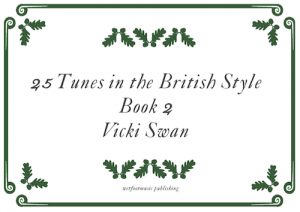 Tunes in the Style is a series of books exploring different styles of music. 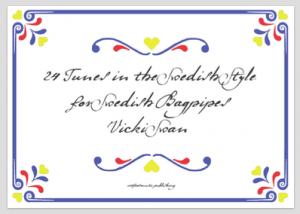 Book 1 has as its focus Swedish music, especially Swedish bagpipe (säckpipa) music. This popular edition has been published for several different instruments and keys. Book 2 has its focus tunes from the British Isles. Originally written for the Swedish Bagpipes there are several versions of this book depending on which instrument and which key of bagpipes you play. Polska, schottis, brudmarsch, vals, slängpolska even the elusive five-times waltz. All presented in an authentic hand-written style. (But very legible, see above! )The different versions of the book are presented below. This is a duet book, so grab your instrument, a friend and have some fun! This version was put together for nyckelharpa, or fiddle or indeed any instrument capable of playing in keys up to about G minor. Range of G below middle C up to G to at the top of the stave. Comes with a CD. All tracks played twice, once solo and once as duet. The Swedish Bagpipe (säckpipa) version of the 24 tunes. The instrument for which these tunes were written. 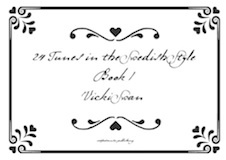 Included in the book is a link to the download of the the audio files. Originally written for the Swedish Bagpipes this is a version written out for conical bagpipes in G (ie border pipes). 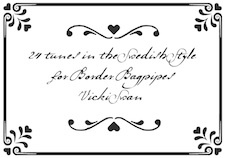 (The tunes are mostly in C minor though, but written for readers of border pipes in G). If you play bagpipes this is for you! You need a set of pipes that has a minor 6th note (ie pipes with a minor 6th).